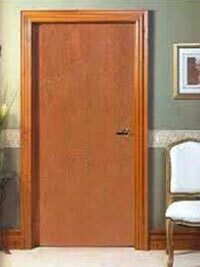 We offer a wide variety of stylish Flush Doors. These Flush Doors that are created out of seasoned and chemically treated timber, makes them dimensionally stable. Our Flush Doors have a solid block board core with BWP grade cross bands and face veneers which are bonded with phenol formaldehyde synthetic resin in hot press process with high pressure and temperature making them 100% boiling water proof. These are made to suit local climatic conditions. These are easy to maintain and are economical. The doors are durable, dimensionally stable, termite resistant, insect and borer proof. These are also free from delaminating, warping and powder free. Supplied in standard sizes as per IS: 25, 30, 32, 35 & 40 mm, we also design flush doors suiting the requirements of our customers. These are available in decorative veneered door i.e. one side/both side teak, lipping - internal or external (hard wood/teak wood) opening for vision panels, panels, louvers, etc.